We hope to create a substantial library of useful information here, relating to WILPF as well as the broader women’s and peace movements. WILPF Colombia have written an article on Abortion Rights as part of the Edinburgh World Justice Festival. Monica Montañez Martínez, WILPF Colombia. 2018. WILPF report: Women in Artisanal Mines in DRC. August 2016. Global Witness report: River of Gold. July 2016. Dangerous Women project. Institute for Advanced Studies in the Humanities at the University of Edinburgh. 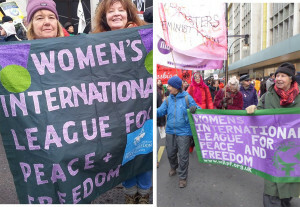 Feature on Chrystal Macmillan by Helen Kay, Scottish Branch, UK WILPF. Global Summit to End Sexual Violence in Conflict. 10-13 June 2014. The Heart of the Matter: the Security of Women and the Security of States. International Security, Vol. 33, No. 3 (Winter 2008/09), pp. 7–45.